Andre was born and raised just up the road in Richmond. His family was steeped in Louisiana Creole culture and took him to dances that his grandparents held at their church parish, St. Mark’s Catholic Church, which featured the best zydeco musicians Louisiana had to offer, including the late great Clifton Chenier, the King of Zydeco, who, when Andre was three years old, grabbed him by the arms and declared him a future accordion player. At age 12, Andre formed his own band and started performing all over northern California. The band currently includes Jahon Pride on bass, George Jackson on drums, Mark Daniels on guitar, and Dwight Carrier on rub-board, as well as Andre on all kinds of accordions. 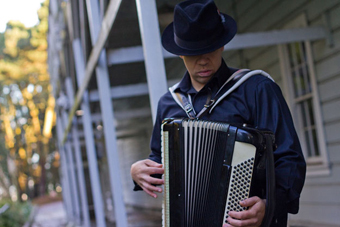 If you like zydeco, you’ll revel in this evening of zydeco magic at the Freight.